Exporting and Importing Tunnelblick Setups - Tunnelblick | Free open source OpenVPN VPN client server software GUI for Mac OS X.
Tunnelblick maintains shared and private configurations for each user on a computer as well as shared configurations that are accessible to all of the users. It also maintains shared and per-user settings that control its behavior and the behavior of both types of configurations. You can export and import these configurations and settings as a backup or for transfer to another computer. Export all configurations and settings on a computer by clicking the "Export Tunnelblick Setup" on the "Utilities" panel of Tunnelblick's "VPN Details" window. Important: Saved usernames and passwords are not exported. For each of the usernames in the left column, select "Do not import" or a username, then click "OK" to do the import. Shared configurations and the settings for them are always imported. Configurations and shared settings are imported immediately, but each user's settings are not imported until the next time that user launches Tunnelblick. Saved usernames and passwords are not imported. If there are more than 64 users on the computer, the import will not be done unless a "username-map.txt" file is included in the .tblkSetup. See below for details. Imports are done in the order in which they appear in the window. Importing a configuration overwrites any existing configuration with the same name. 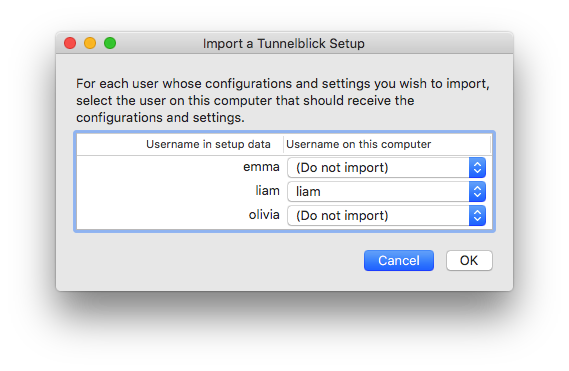 When importing data from a .tblkSetup (generated by Tunnelblick's "Export Tunnelblick Setup" Utility command), Tunnelblick will usually let you interactively choose which users' data to import and to what user the data should be imported. However, when the computer has more than 64 users, you must create a file to instruct Tunnelblick how to import the data. Such a file may also be used to copy the import data from one user to multiple users on the import computer at one time. The configurations and settings for user "liam" on the exporting computer will be imported to user "liam" and to user "noah" on the importing computer. The configurations and settings for users "emma" and "olivia" on the exporting computer will be imported to user "william" on the importing computer. The usernames are the users' "short" usernames and cannot contain spaces. Spaces and tabs around names are ignored. Configurations are imported immediately, but a user's settings are not imported until the next time that user launches Tunnelblick. Imports to a user are done in the order in which they appear in the file.